16 affordable two- and three-bedroom condominium residences across seven parcels totaling nearly one acre located steps from Codman Square and the Talbot Avenue MBTA commuter rail station. The parcels are located along New England Avenue, as well as Mallard, Colonial and Southern Avenues. Eight residences will be sold to residents earning 80% of Area Median Income (AMI) or below, and eight residences will be sold to residents earning 100% of AMI or below. A total of nine new buildings will be constructed at New England Heritage Homes, including seven attached, side-by-side duplexes and two single-family homes. All residences will be constructed to LEED Silver sustainability standards. A total of 20 parking spaces will be constructed at New England Heritage Homes, in addition to bicycle storage. A building permit has been issued for the upcoming affordable condo development, New England Heritage Homes near Codman Square in Dorchester. In total 16 units will be built, a mix of three and three bedroom residences between nine new buildings. All residences will be constructed to LEED Silver sustainability standards. The Boston Planning & Development Agency (BPDA) approved New England Heritage Homes, a development featuring 16 affordable condominium residences, at last night's board meeting. New England Heritage Homes will require zoning relief from the Zoning Board of Appeals (ZBA) before moving forward with construction, which is expected to commence in December 2017. 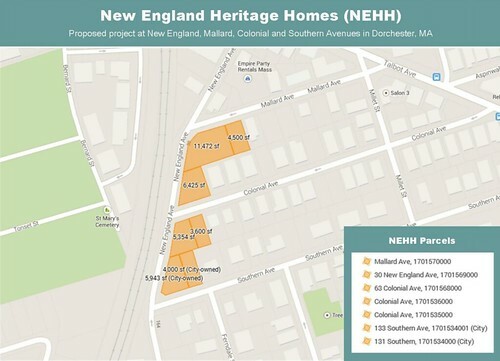 Completion of New England Heritage Homes is expected in November 2018.